A shade that matches the wedding decor is fitting for the bride's mother. 3 What Color Dress Does the Mother of the Bride Wear? If the wedding takes place outside or has a spring or summer theme, it is acceptable for the mother of the bride to wear a tasteful sundress (with the bride's consent, of course). A long sundress with a floral pattern can be elegant and appropriate; a thin shawl that matches the colors in the dress is fitting for an evening wedding. While a sundress is not traditional wedding wear for the bride's mother, you can fit right in with the color scheme with this outfit or indirectly convey your daughter's bright and cheery nature. A pants suit is a feasible choice for a mother of the bride who doesn't particularly like dressing up, or for a woman who wants to wear something unconventional to her daughter's wedding. A suit in a color other than black or navy blue will keep the outfit from looking too business-like. Tailored slacks and a blazer in a color that matches the wedding decor or the bridesmaids' dresses like peach or lavender is appealing but not too overpowering. Or, you can make the pants suit a little fancier by wearing a sequined or lace tank top with dark-colored slacks and a matching jacket. The Knot website asserts that it's generally not a good idea to wear a striking color like red to your daughter's wedding. Unless, of course, the bride is OK with it. 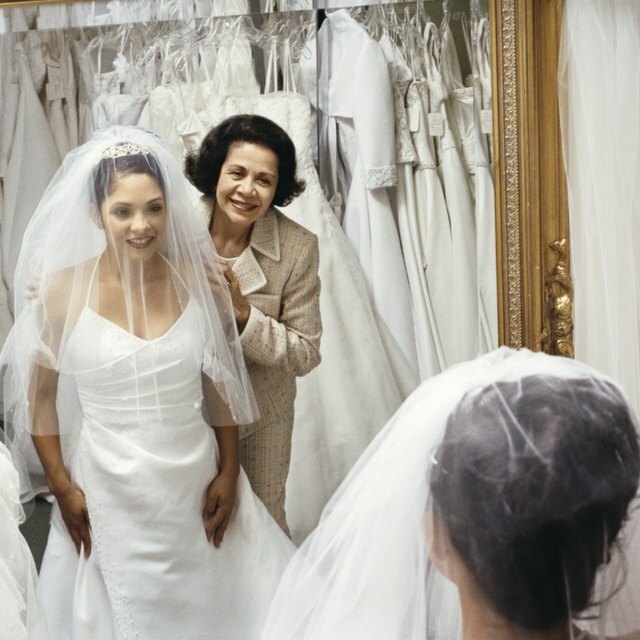 Even though it's not in keeping with traditional etiquette, the mother of the bride can wear white if the style of her dress is nothing like the bride's, and the bride is fine with the idea. Black, which is traditionally the color of mourning and not recommended for weddings, can appear very classic and tailored for mothers of the bride, especially when accented with a metallic shade like gold or silver. Pastels are also safe color choices for mother-of-the-bride outfits.